With thanks to the North Shore librarians... here's a nice writeup in the North Shore News. Read about the young heroes of British Columbia's colourful past, from the gold rush, to China town at the turn of the century. Celebrate B.C. 's 150th birthday by reading these exciting stories available at any branch of the North Vancouver District Public Library. 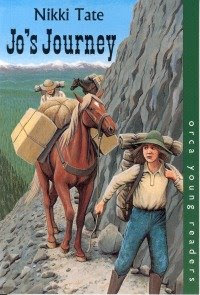 - Jo's Journey by Nikki Tate, Orca Book Publishers, 122 pages, $7.95. Nikki Tate's novel Jo's Triumph (sequel is Jo's Journey) features Jocelyn, a feisty young orphan who escapes from The Carson City Home for Unfortunate Children and disguises herself as a boy. Little does she know that her expertise with horses will lead her straight to the Pony Express. "Jo" has all kinds of adventures along the way including an encounter with the meanest man on the route who learns her secret and threatens to reveal Jo's identity. In Jo's Journey, Jo hears talk of gold strikes in British Columbia's Cariboo. Together with her friend Bart, they make the journey northward in search of gold! Jo and Bart encounter the roughness of the landscape as well as some very rough characters along their journey -- with so many obstacles to overcome, it seems they will never reach their destination. Jo's adventures offer excitement for young readers in grades 4 and up. Both girls and boys will enjoy the trials and tribulations that Jo and Bart experience and readers will learn lots of interesting facts about the Cariboo region of British Columbia during the gold rush. Readers also might enjoy Tate's mystery series set in the Gulf Islands, including Trouble on Tarragon Island, which was nominated for a Red Cedar book award this year. Rachel Brown is the children's librarian/assistant branch manager at the Parkgate Branch of the North Vancouver District Library. She loves reading adventure stories with feisty characters like Jo.